The biggest predictor of change is misery. The biggest reason people will change is because they are suffering to a degree that they can’t continue to live the same way. Denial is a film about climate change. That was the original intention of both the director, Derek Hallquist, and the subject of the film, his dad, David Hallquist. It is a thought provoking analysis of our painfully outdated power grid and the resistance to change it—resistance from those profiting from the fossil fuel industry, resistance from legislators in Washington, DC, resistance from the utility companies themselves, and resistance from consumers who don’t fully understand how electricity is generated. As consumers, we rarely think about where our electricity comes from. In fact, it’s only when we lose power or our power bill increases that we think much about it at all. We trust utility companies to provide us with electricity, and we rarely question the efficiency of how that power is generated, or what impact it is having on the environment. If we knew the truth, we might be less accepting of this arrangement: “Humans don’t like change very much because it interferes with your plans” (Denial). As CEO of Vermont Electric Cooperative, David Hallquist walks a tightrope as he attempts to change the way electricity is generated and used in order to reduce its carbon footprint. While he does this, he must also meet the company’s goal of providing reliable and affordable service. He falters as he works to increase the efficiency of the grid. He understands that it won’t happen overnight, and while at times it appears he is sending mixed messages, he is the only true realist in the mix. He doesn’t want to jump on board the renewable energy train just because it is trendy. He knows that while the future depends on the implementation of renewables, the grid needs to be adequately prepared to use them consistently and efficiently: “resistance, however, comes in many forms—traditionalists balk at the renewable intermittency, solar and wind advocates think Hallquist is dragging his feet, and the public fears that ‘smart’ meters on their homes will send private information about their energy use to the government” (Denial). While Hallquist struggles to build a transparent company, he also battles his own lack of transparency. His family (his wife, two daughters, and son – who is also filming) all figure prominently in Denial. With tremendous courage and a deep understanding of all that is at risk both personally and professionally, Hallquist reveals the burden he has borne his entire life; he is, and always has been, a woman inside: “I was always acting. I was just playing a role. But when I started approaching 50, I began to have suicidal thoughts…. Sometimes I feel that people would rather I be dead than know the truth” (Hallquist). David’s transition to Christine is the ultimate act of truth telling, and we are privileged to witness all of the confusion, anger, pain, relief, and love experienced by Christine and her family as they work through their new reality: “All of us deceive ourselves. It is part of our DNA. But at some point it’s going to catch up with you. We want security so desperately, but you know what? We can’t have that” (Warren). “I’m done faking it. I wonder if that’s how we all feel throughout our whole lives” (Hallquist). What is so incredibly beautiful about this film is the raw honesty and full exposure of a person claiming her genuine path against the larger backdrop of a nation struggling to admit and come to terms with climate change. We all struggle to accept certain truths, both personally and societally: “You try to compartmentalize this stuff and it’s hard. It’s too hard. People in general don’t want to hear the truth…. Any time that you have to admit something to yourself that’s painful, you’re going to want to deny it. They’re doing the same thing as me—like I was doing denying my truth. It (the efficiency of the power grid) can all be solved, but the will of the consumer has to drive it” (Hallquist). 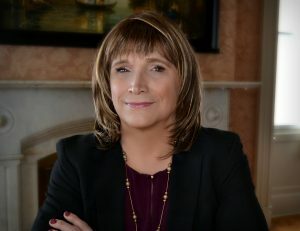 Christine Hallquist was the first CEO to transition publically at work. She risked everything in order to be true to herself, and ultimately, her company and family supported her. 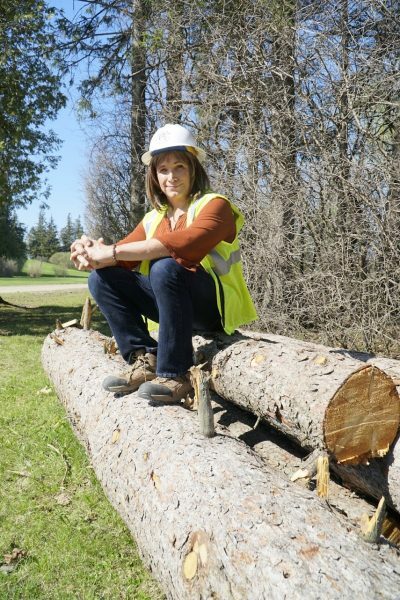 This past spring, she left her position as CEO of Vermont Electric Cooperative in order to run for governor of Vermont. I was lucky enough to interview her for Vermont Woman shortly after she made this decision, and even luckier to get to know her personally. If you know me, you know that I am a truth teller, having shared my own painful truths thanks to the courage of many other women who were brave enough to share their own stories before me. I firmly believe that sharing our truths heals ourselves and helps others. I am thrilled to see so many women running for office in an entirely new way—by sharing their own personal stories. Christine Hallquist is one of those women. She is genuine, open, and empathetic. She is a collaborative leader who listens to all perspectives and seeks input from all sources. She is a team builder who thinks outside the box in order to solve problems creatively. She is exactly the type of leader we need—someone who supports true equality, provides collaborative leadership, and engages in creative problem solving. If you live in Vermont, I hope you will get out and vote in the August 14th primary. And if you don’t, I hope you will take the time to get to know the women ‘running as they are’ in your own part of the country.